A few details about an upcoming LG tablet became available recently, but there are plenty of specs still missing. Nevertheless, the LG V500 may be the already rumored new G Pad Tablet. Not too long ago, it was rumored that LG had plans to release a new tablet called the G Pad. The rumor mentioned a Snapdragon 800 processor, 2 GB of memory and an 8.3-inch display sporting an impressive resolution for its size - exactly 1,920X1,200 pixels. 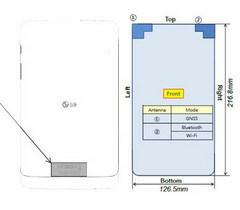 Now, a leak from the FCC shows the design of such a tablet that LG is working on, but there is no detailed information about its hardware - only a few minor features. For example, nothing is known about the processor used or the amount of memory it has, but a Snapdragon and 2 GB or even 4 GB of memory are highly probable. The LG V500 will feature Bluetooth 4.0 LE and dual band 802.11 a/b/g/n WiFi. The 9.8-inch tablet (could be 10.1-inch as well) is 5 inches wide and 8.5 inches long. In the days to follow, the LG V500/LG G Pad benchmark results may appear on GFX Bench and more unofficial details would become available, while an official statement is expected to be issued later.